In my last post I discussed what my current issue is, the Fame distribution curve, and how I planned on fixing it. I've been hard at work revising the entire Quest deck to incorporate a new design and pacing, and I'm nearly done. The last few Quests in my list were the Heroic Quests with objectives to travel to the western continent and slay one of HeroCraft's boss Monsters. Heroic Monsters have never quite worked the way I hoped they would, and it was time that I took a hard look at them. After much internal debate, I finally decided to cut them in their current form. This removes an entire deck, several pages of rules, and a lot of random weirdness. I really didn't want to lose the idea of Heroic Monsters, though, as defeating bosses is a staple in any good RPG! Instead of having isolated encounters, I'm adding Heroic Monsters to the Hazard decks. While this removes the strategic element and replaces it with a random one, the benefits outweigh the drawbacks. Players will now face Heroic Monsters as part of every game, and while the overall Fame reward has decreased, the flow has stabilized quite a bit more. I'm revisiting five total Monsters, two Eastern and three Western. 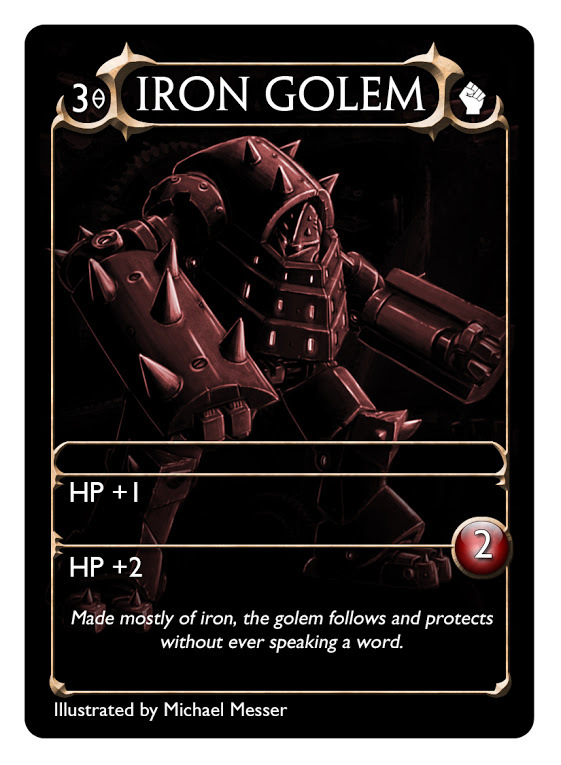 In addition to the mechanics changes I'm making, one of my artists Michael has recently finished a new piece of art, the Iron Golem. There are four Golems in the game, and I tasked Mike with creating the first. I love his design and am excited to incorporate it and change it to fit the three others: Stone, Gold, and Diamond.